"Going coconut again ?!" ... ha ha ! No complain cos my big kids love these unique Ondeh-Ondeh Cupcakes. While we are so used to eating Ondeh-Ondeh (usually bought from some food stalls selling Nyonya kuehs and occasionally I will make some, shared here and here ) but we have not tried them in cupcakes. 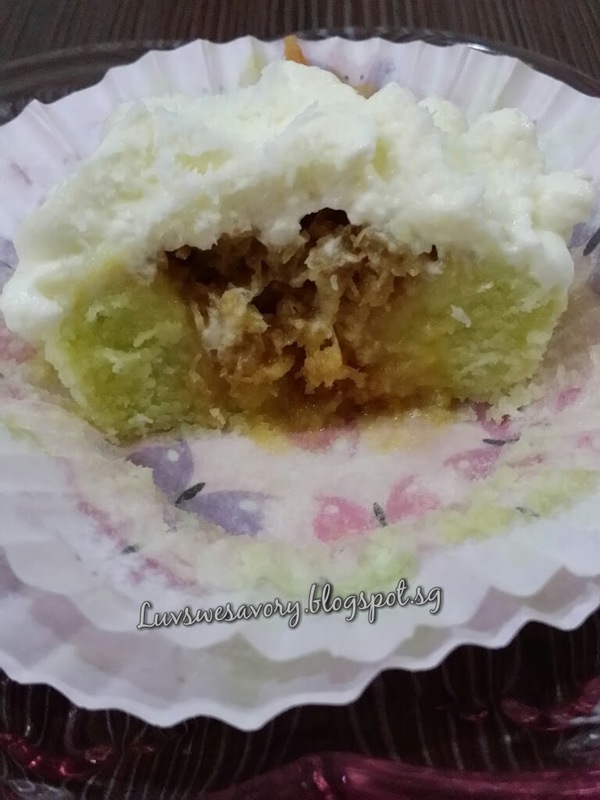 I know baking or cooking with pandan leaves, gula melaka and coconut would be very fragrant and yummy ^-^! Below my modified version as I've adjusted the quantity of some ingredients. 2 tablespoons concentrated pandan extract (refer here for homemade concentrated pandan extract). 1. 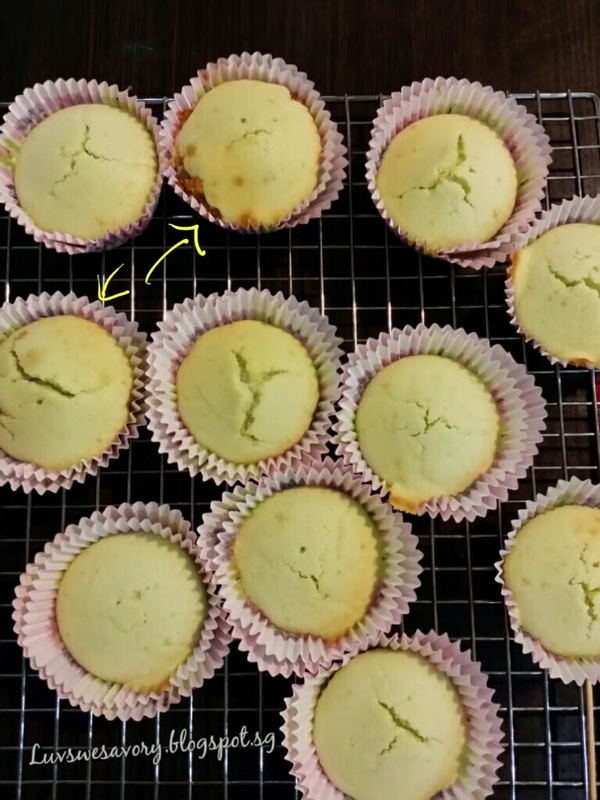 Preheat oven to 180°C and line the muffin pan with cupcake liners. (The temperature of the oven may vary, do adjust the temperature and timing to suit your oven). Sift the flour and baking powder together into a large bowl and set aside. 2. In a clean mixing bowl, cream the butter and caster sugar till pale and creamy with electric mixer. Add one egg at a time and mix on medium speed. 3. Add the sifted flour, alternating with milk and the pandan extract. Scrape down the sides of the mixing bowl and beat for another 1 - 2 minutes or until the batter is well incorporated. 4. Use an ice cream scoop or 2 spoons to spoon the batter into the cupcake liners, filling each one only two-thirds full. 5. Bake in the oven for 15 to 17 minutes. Check for doneness with a toothpick inserted into the center of a cake if it comes out clean. Remove cupcakes from the pan and allow to cool completely on rack. 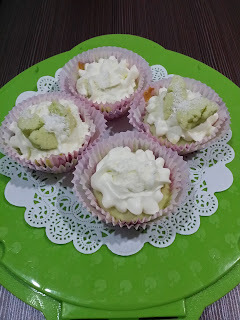 Note: I made an experiment for 3 cupcakes (with arrows) filled with the pandan gula melaka coconut filling and baked them together. Simply dropped a scoop of batter, fill in 1 teaspoon of filling and topped with 1 scoop of batter. They turned out great too without the creamy whipped cream. 2) Wash clean 1 pandan leaf (screwpines) and tie a knot. 3) In a saucepan, pour about 150ml water, add 200g gula melaka/palm sugar (chopped smaller size) and bring to a boil till it melt. (do adjust the sweetness to your preference). 4) Add in the grated coconut and pandan leaf. Cook till the mixture fairly dry over medium-low heat. Set aside to cool. (The filling can be prepared a day in advance and keep in fridge until use). Note: I didn't use up all and freeze the balance. Garnish: about 6 - 7 tablespoons dessicated coconut (to sprinkle about 1/2 teaspoon lightly on frosting of each cupcake). 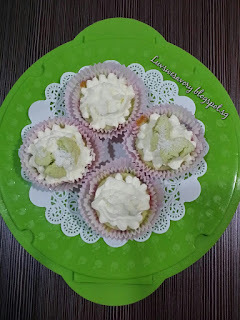 To assemble, core the cupcakes, then fill in with 1 teaspoon pandan gula melaka coconut filling. Frost the cupcakes and sprinkle some dessicated coconut. Yummy-licious! Love the fragrant pandan gula melaka coconut filling that complement the soft cupcake texture. My big kids gave thumbs up too ^-^! Thanks, they tasted good too ^-^! WOW Karen! This sounds interesting. 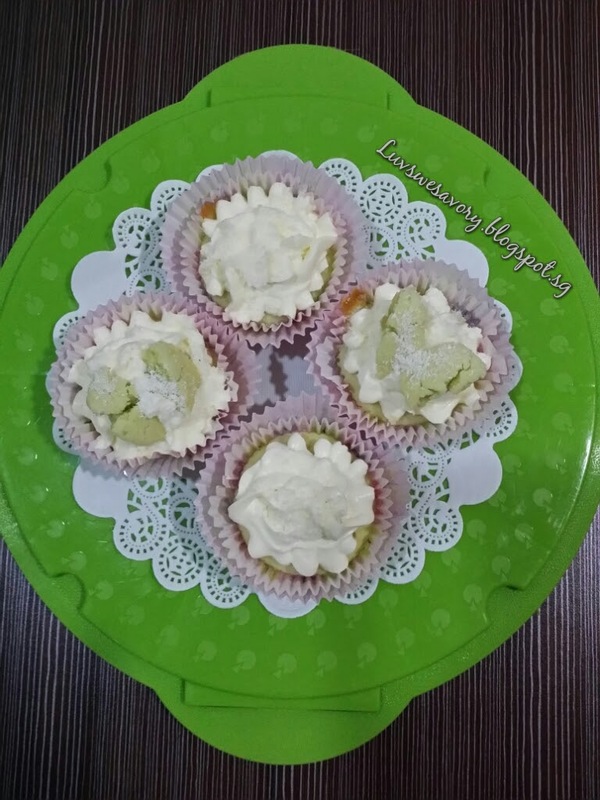 I've never thought of making ondeh ondeh into cupcake :D Looks so yummy and easy to make too! This is one of my to-do list too! Yours looks yummilicious!! Hee .. hee. .. perhaps to 'jump Q' to bake these interesting n yummy cupcakes ?! You are so creative transforming oneh oneh into cupcakes! 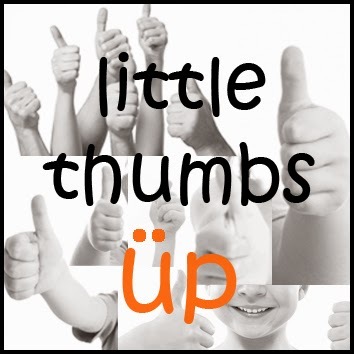 Triple thumbs up... the extra one is from my imaginary hand... LOL! Thanks Zoe, I'm learning from others too^-^! Karen, I fond ondeh-ondeh very additive! I can keep popping one by one into my mouth. And now you make the cupcake version. I want! Hi Phong Hong, I can't stopped popping ondeh-ondeh too but somehow glutinous rice flour caused indigestion. 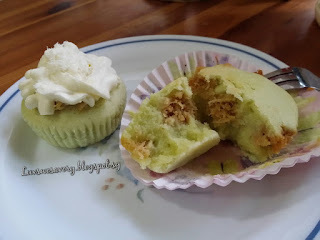 ... these ondeh-ondeh cupcakes are just right for me.